That is, on Harbord St. During peak hours. So the city is going to do something about it. Awesome. Way to go city! But unlikely it will be that awesome. The bi-directional design will move both the east and west bound bike lanes to one side of the street. Therefore it will mean the removal of on-street parking on parts of Harbord – which I’m sure will be a pain for many. But I’ll remain a bit selfish here and say I am thrilled about this plan. One step forward. Last Thursday, the city organized a Public Drop-In Event to review the designs for the improved bike lane. 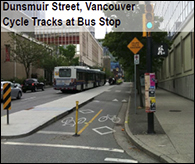 It’s cool – they really are looking for the public’s opinion as they develop the bike lanes. Unfortunately I couldn’t make it, but, if you use Harbord, I encourage you to take a look at the current report online here. The city hasn’t finalized the design yet. They want our input. On page 21 they show the different design considerations. What gets my fairly uninformed vote? Montreal’s full curb separation design. Of course I like the more expensive design which will require more construction. But this is an investment in the city’s future. And this looks the safest of all options. Harbord already has painted separation so I can’t see how bi-directional painted separation makes it safer. To be honest, I’m usually a lot more scared of the way other cyclists ride so I don’t want one coming at me from the opposite direction without a separate from traffic. I foresee many more fights among cyclists. The raised cycle track seems like I could easily fall off the edge… again I called this my uninformed decision so obviously look for your personal comments here. I also came across this report on the many problems with bi-directional cycling paths. What works for Harbord is there are only a few major intersection, so turning isn’t as much of an issue. Read ibiketo.ca blog about their thoughts on uni-directional vs. bi-directional when it comes to Richmond and Adelaide. Again my vote – Full Curb Separation. Make the investment, make it safe. Cyclists represent 40% of Harbord traffic during peak hours. And as they say in Field Of Dream, if you build it they will come. I guarantee if they put in a full curb separation bike lane – the cyclists will come! The coolest thing is that the city wants to hear from you! So share your voice … email bikeplan@toronto.ca. And please share your opinion with me too. Something that has always bothered me are the number of parents who use bike trailers on busy downtown streets. Is it just me or is this completely insane? 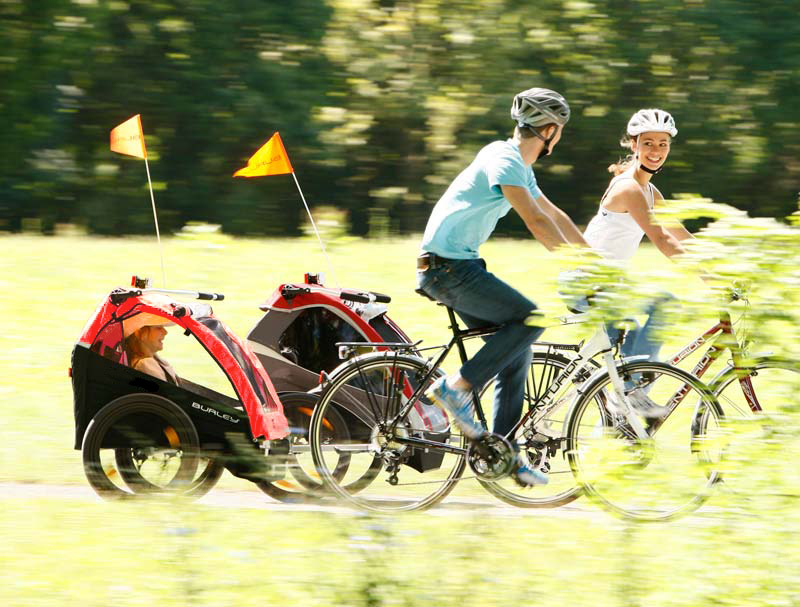 While I’m sure those parents are good cyclists, I truly believe they’re putting their children at great risk. With an average of 1,500 cyclist-vehicle collisions per year in Toronto, it’s fine to put yourself at this risk but why make your children so vulnerable? I really don’t think I even need to explain why I think it is so dangerous to use a child trailer on main streets. Where do I think bike trailers belong? Such as a scene like this – they look like good parents! But please, if you are one of those parents that I believe are out of their minds, I want to hear from you! Let me know what I’m missing. Also feel free to participate in the poll! Sometimes I am a bad cyclist. I do things I shouldn’t. It just seems so easy to break the rules. I know I shouldn’t do them. But sometimes I think – my bike isn’t a car so why should it follow the exact same rules as a car? For example, on my ride to work I go through Trinity Bellwoods. And I have to turn into the park via the sidewalk. Should I be get off my bike when I go on the sidewalk then get back on my bike once I’m on the path? I would be a fan of bike licensing. But I just can’t imagine what the process is for something like this. * Licensing in and of itself does not change the behaviour of cyclists who are disobeying traffic laws. What are your thoughts on bike licensing? And am I a bad cyclist? So I was doing my usual perusing through Twitter this morning, when I came across this retweeted post from @MetroMorning. I love this sign – both agree and disagree with it – but it really says a lot about the serious problem of bike stealing and how desperate some people feel after their bike is taken from them. I’m not going to get into my own psychological analysis of why people steal bikes. To me their issues run a lot deeper than simply look at a Help Wanted Ad and get a job. 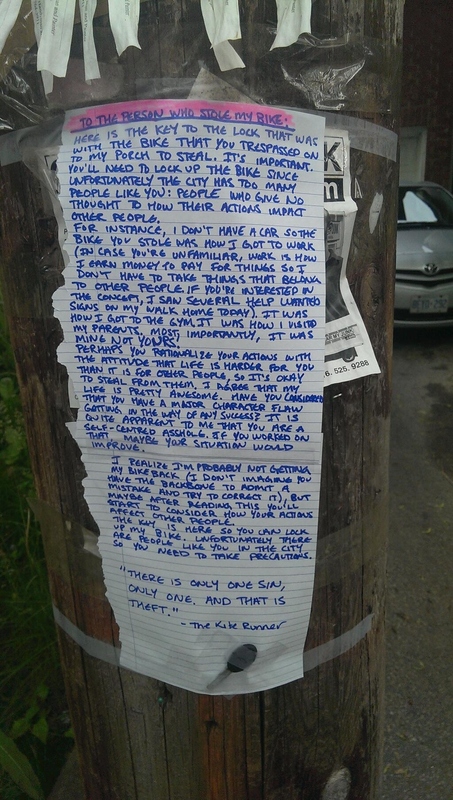 However, stealing bikes is a serious issue we face in Toronto. 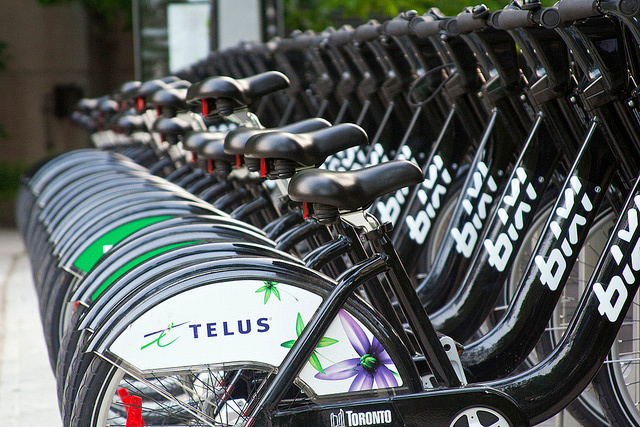 Toronto police report that over 3,000 bikes were stolen in 2011. But I want @SineadBrown to know that, maybe if she’s really lucky, the thief may return her bike because it happened to me. I used to live on a main Toronto street on top of a store. 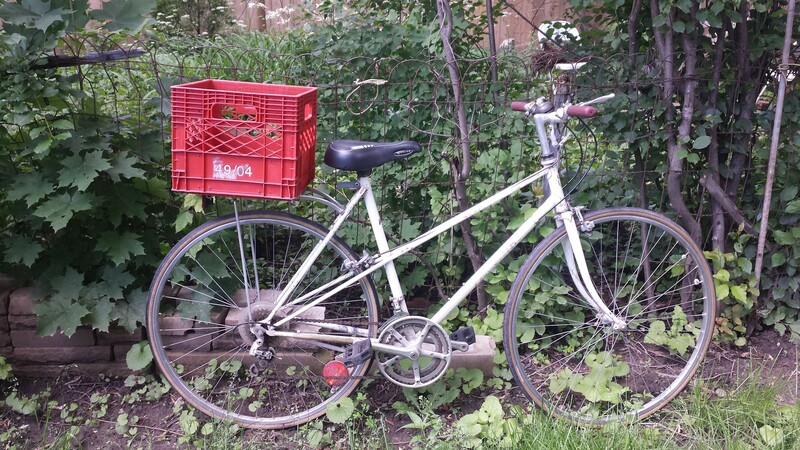 I always locked my bike up right in front of my place (not Grandpa’s, my other one *see below). One day I locked it up by the front wheel only (never, ever do this). So someone came and unhinged the wheel and took the rest of my bike. When I saw the lasting remains of my bike, I was devastated. This was my mode of transportation; it’s how I got everywhere, and it was my freedom! I remember being so upset I told everyone who walked by about my stolen bike and how pissed off I was. Some people cared, others just walked quickly pass me. Just like @SineadBrown, I felt like a crazy person. I’m pretty sure a single tear rolled down my cheek that day. Later that day, I was supposed to meet up with a friend for dinner. I was mad because it meant I had to leave my house 30 minutes earlier than usual to take the horrendous TTC to College St. But lo and behold, when I left my house, my bike had returned! There, sitting on the post like it never left me, was my bike reunited with its wheel. I was thrilled (again I think a single tear rolled down my cheek). I figured the person who stole my bike must have seen how much it upset me. And so the thief took the time to sit and think about what he/she had done. I was so happy I yelled thank you in hopes the thief would hear me. I don’t know what drives people to steal bikes. But to help stop it – lock up your bike and lock it up properly. Do not lock your bike to itself – front wheel or rear wheel to frame. Always position your u-lock with keyway facing down.. If you’re only locking one wheel, it is recommended that you capture the rear wheel as part of your lock-up. Replacement cost for the rear wheel can be up to double the cost of the front wheel.